business development | Imagine Creative Communications Inc. Many of us feel we have missed the boat when it comes to the inventive genius of people like Steve Jobs. We feel stuck in a rut. Amanda Lang feels you can change that with one question: Why? 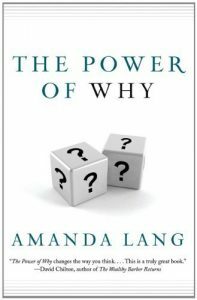 The Chief Business Correspondent for CBC and co-host of the Lang & O’Leary Exchange, in her recent book, The Power of Why: Simple Questions that Lead to Success, explores some of the great creative successes in business and how they happened. For her, it all boils down to not being afraid to ask questions. It’s the child-like curiosity of some people that leads to divergent thinking that refuses to accept the status quo and look beyond them to see new product or services opportunities or better respond to their clients needs. The book is entertainingly conversational in tone, but well-researched* and packed with useful stories and ideas that can be applied to your own business or even your personal life. I was fascinated by the idea and immediately saw ways to put the ideas into action immediately—for myself and my clients. For me, it was an energizing and empowering book, reminding people that they don’t have invent a smart phone or turn around a failing multinational corporation to be a creative thinker. Small, incremental improvements can have a big impact on personal or work satisfaction, not to mention improving your businesses bottom line. *A little shout out to my son, Matt, who was the researcher for the book.